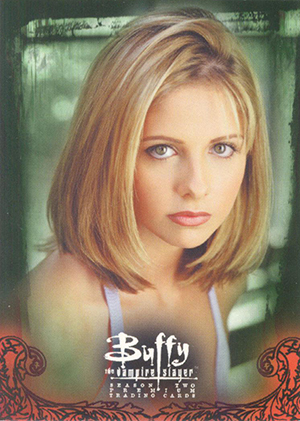 As far as modern entertainment trading card franchises go, Buffy Summers and her Scooby gang rank were a legitimate hobby phenomenon. 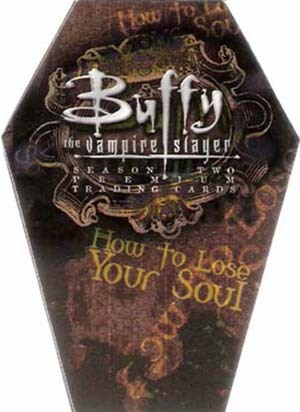 1999 Inkworks Buffy the Vampire Slayer Season 2 remains one of the most coveted sets in the franchise thanks, in part, to some awesome (and rare) autographs. The base set has 90 cards. 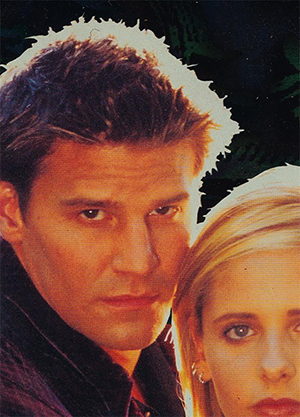 The cover all 22 second season episodes that originally aired in 1997-98. Additional subsets cover the show's characters, both the human and monster variety. Image quality isn't the greatest, however the set still holds solid value compared to a lot of other modern base sets. Leading the chase are five autographs. The set offers no box guarantees so none are promised on a per-box basis. Among the signers is John Ritter, known best as Jack Tripper on Three's Company. He passed away just a few years after the set was released, further fueling demand. 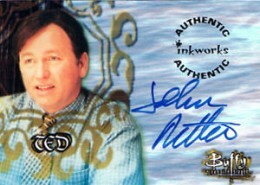 This is Ritter's only certified autograph card. 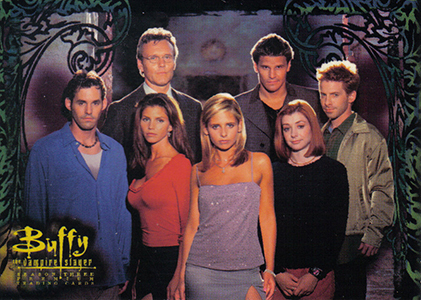 Other 1999 Inkworks Buffy the Vampire Slayer autographs include Anthony Stewart Head (Giles) and Charisma Carpenter (Cordelia). Carpenter's card can be found signed with her full name and just her first name. The full-name version is rarer and carries a premium. Other inserts in the product follow a fairly standard Inkworks formula. Dark Destiny is a nine-card foil puzzle. It was also offered separately as a limited edition uncut sheet numbered to 999. Love Bites is a six-card insert set that breaks down some of the show's romantic angles. Finally, there's a rare How to Lose Your Soul card. Inserted 1:08 packs, it's instantly recognizable due to its die-cut coffin design. 90 cards. Shop for base sets on eBay. 4 "If They Hurt Willow..."
18 "You Don't Know Me?" 23 "Was It Good for You?" 36 "It Explains a Lot"
46 "Angel Sends His Love"
51 "Visiting Hours Are Over"
58 "It's a Big Rock"
61 "I'm All You Got"
5 cards. Numbering continues from Season 1 set. Odds not released. Carpenter can be found with two versions. One is signed, "Charisma." The rarer version is her full name, "Charisma Carpenter." Ritter signed with multiple colors including blue, black, red and brown. 9 cards. Inserted 1:11 packs. Also available as an uncut sheet numbered to 999. 1 card. Inserted 1:108 packs. 6 cards. Inserted 1:18 packs. 1 card. Card is a promo for Season 3 set. B2-AL1 Who Needs a Social Life? M6-M12 available with DVD exclusively at Suncoast Video.